MANILA, Philippines – More good news await Filipino nurses looking to reach their dreams in Germany. The Philippine Overseas Employment Administration (POEA) recently announced that Filipino nurses who were hired through the Germany Federal Republic's Triple Win Project will get a salary increase of 100 euros. 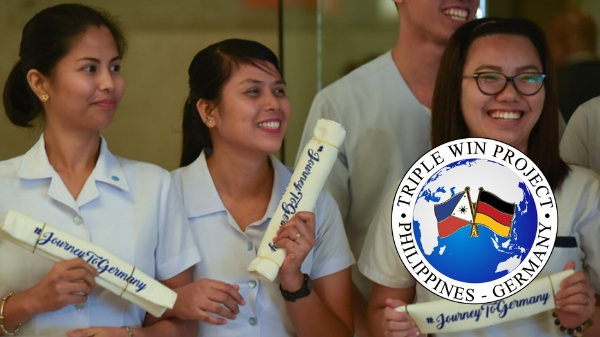 In a statement, POEA stated that the German government decided to increase the minimum wage for nurses hired through the Triple Win Project during the 5th Joint Committee Meeting in Bonn last year. The latest exchange rate of 100 euros is almost at P6,000. Depending on the foreign exchange rate, hired Filipino nurses can earn as much as P144,000 per month. Prior to announcement, the minimum wage was 1,900 euros and 2,300 euros, respectively. The POEA, however, clarified the increase only applies to recently hired Filipino nurses. For those who are already in Germany and those whose employment contracts have already been signed in 2018 but have not yet been processed at the POEA, they are excluded from the increase. At present, the 400 vacancies are still being filled up and POEA is still encouraging qualified nurses to apply. Since it's a government-to-government program, hired applicants need not to pay anything. The employer will pay for the visa and airfare from the Philippines to Germany. Assistance will also be given to the employee to find a comfortable accommodation. Depending on the agreement, the employee shall bear the expenses in full or in part of the board and lodging. Qualified applicants must first register at POEA's online service (http://eservices.poea.gov.ph). Applicants must personally submit the listed required documents (fastened in a folder) with a heading "German Federal Employment Agency RSF No. 180028" at the Blas F. Ople Bldg. (formerly POEA Bldg. ), Ortigas Avenue corner EDSA, Mandaluyong City. Deadline for submission of applications at the POEA Central and its regional offices is on February 28. The interview by the employers is set by the end of March.